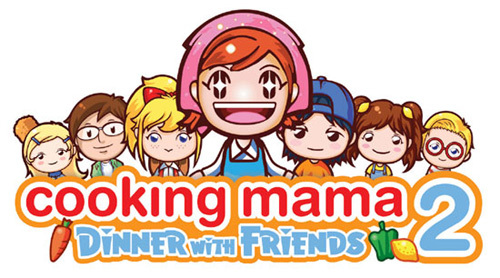 Majesco has picked up COOKING MAMA 2: Dinner with Friends! After a sojourn to the Nintendo Wii with Cooking Mama: Cook-Off , Mama’s back on the Nintendo DS with Cooking Mama 2: Dinner with Friends! A game that’s based on cooking, Cooking Mama allows you to use the stylus to perform various cooking tasks like chopping, frying, kneading and mixing, to be able to cook a wide assortment of dishes, “just like Mama.” The new version features 80 new recipes, a wireless cook-off mode against up to four friends, a customization mode that lets you dress up your kitchen, Mama included! And the friends part? After you cook, nine of “your” picky friends taste and judge your cooking! It has the makings of a Food Network reality TV show, don’t you think? Despite the weird premise, the first Cooking Mama was a hit. Everyone, from gamers who couldn’t cook to cooks who have never played a video game, loved it. Everyone was playing and enjoying themselves. I said goodbye to dignity and blew into my DS’s microphone even while I commuted, just because Mamaâ€”I feared her burning wrathâ€”insisted I do so! The great thing about it is that the cooking techniques and recipes are realistic. Mama’s Tonkatsu cooking procedure is almost identical to mine, and her korokke (croquette) technique? I learned to make korokke from Mama! A release date hasn’t been given yet, but Majesco has also dropped hints that a new version for the Wii is also in the works. If you’d like to read more, the official press release is here. A Handy Dandy Cooking Guide Anyone? And while we’re at it, let me mention something that caught my eye a few months ago, Shaberu! DS O-Ryouri Navi (Talking DS Cooking Navi). 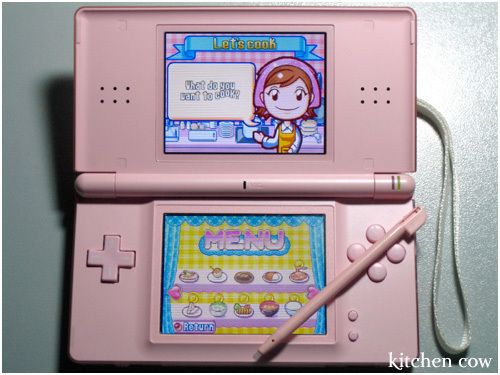 Another DS non-game, this is actually a talking cooking guide that runs on the DS! It has recipes, step-by-step procedures and a built-in timer that tells you when your dish is cooked. It’s even voice activated so you just have to tell it to turn the page, useful if your hands are gummy with flour, eggs and breadcrumbs (which can be minimized if you to try this tip!). Silly? Well, silly or not, it is a hit in Japan, spawning Shaberu! DS O-Ryouri Navi Marugoto Teikoku Hotel (Talking DS Cooking Navi Marugoto Teikoku Hotel), a follow-up title that features recipes from top hotel chefs! I honestly don’t think I need itâ€”but I definitely want it! Right now, it’s only in Japanese but there are news of it being localized in Europe. As long as I get my hands on an English version, I’ll be happy. 14 Responses to (Cooking) Mama’s Back! “Discovering that a sequel’s coming just made my day. Hooray for Nintendo & cooking games! By the way, I’m so jealous of your pink DS Lite. So cute! *whistles* Neat. Neat. Another one to look forward too.. I love anime and drama heehee–you probably read it from my personal Livejournal. Right now, I’m in the middle of Bambino! a dorama starring Matsumoto Jun. It gets mixed reactions, but I love the cooking part, makes me want to work in the kitchen! I also had fun watching Yakitate Japan, though it’s more baking centric than anything else. I never got a chance to watch Cooking Master Boy, which I totally regret I plan to watch Lunch no Juou once I get the time, and that other drama with Nino from Arashi where he works at a Chinese restaurant. There was word that Europe will have an official release. Rumor has it that it will be ported to the US as well, but nothing official. The Cooking Navi is very interesting, no? I was going through a message board about it and it makes me want it more. For example, you can jot down the number of people you’re cooking for and it automatically adjusts the recipe! And it takes allergies in consideration and makes meal plans and stuff. It’s all full of win! have you seen lunch no joou yet? it’s good! (omurice!!) don’t watch on an empty stomach, though….^_~ kuitan (eating detective) is also quite good. Ugh I want a DS Lite!!! I need that Cooking Mama game. So cute. I really think DS Lites are worth it. The amount of fun and entertainment Sakura-hime has brought me is priceless. And if you can pester Aleq into getting one as well, it’s even better because you can play all sorts of competitive / cooperative wifi games vs. each other 😀 It’s relatively cheap, compared to a PSP at least. Ah, but there is a certain skill in making the water reach the lid. All salary men and office ladies must master said skill as the ability to subsist on cup noodles while working over lunch is essential. So that line? It’s the guardian of sustenance. It’s all zen I tell you. So do I! I’m hoping the European version has english included, because at least the European version was confirmed. The US version remains rumors but I’m definitely crossing my fingers for it.